Before anything else, gang, as the Cheyenne are a tribe... let the church say A-ha. Putting the nation's longest diocesan vacancy to rest, this morning the Pope named Fr Paul Etienne -- pastor of his boyhood parish and a rural dean in the archdiocese of Indianapolis -- as bishop of Cheyenne, heading up Wyoming's statewide diocese of 50,000. Continuing the US' recent streak of young nominees with sizable pastoral experience, Etienne -- a onetime staffer for the US bishops who turned 50 in June -- succeeds Bishop David Ricken, who was transferred to the diocese of Green Bay in July 2008. One of six children, the bishop-elect comes from an exceptional family as vocations go; two of his younger brothers are priests in the adjacent diocese of Evansville, and his sister Nicolette is... Sister Nicolette -- a professed Benedictine in the Hoosier State who currently serves as an elementary-school religion teacher (and has a blog, to boot). 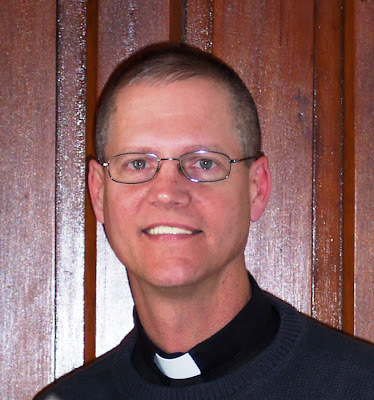 Ordained in 1992, Paul Etienne (said to be pronounced "A-chen" given the family's Germanic roots) earned a licentiate in spiritual theology in Rome, returning home to parish work while serving by turns as the Indy church's vocation director and vice-rector of its Bishop Bruté College Seminary. Last May, the hunting enthusiast described as "extremely charismatic, charming, humble and family-oriented" was dispatched from the seminary and his city pastorate to a deanery along the archdiocese's rural southwest border, where he's since pastored two parishes -- one, his boyhood church, and another which encompassed an entire county of some 20,000 residents -- doing some spiritual direction at St Meinrad in his spare time. Suffice it to say, it's been sound prep for what's to come... all 98,000 square miles of it. Following Ricken's departure, the massive Wyoming church has experienced a difficult interregnum, most prominently evidenced by February's significant budget cuts that slashed everything from the diocese's 57 year-old newspaper to its education and youth ministry offices, and the summer 2008 settlement of a Missouri suit brought by three victim-survivors who alleged abuse by Ricken's predecessor, Bishop Joseph Hart, who retired in 2001. Given the context, it's especially significant that the new bishop comes with experience of college-level education following Ricken's prominent advocacy for Wyoming Catholic College, a new institute whose founding the prior ordinary championed in concert with Cheyenne's metropolitan, Denver Archbishop Charles Chaput. Per its by-laws, the bishop of Cheyenne serves as WCC's ex officio board chair; founded in 2007 with 35 students and now housed on an interim campus, the college's current academic year was opened early last month by Cardinal Daniel DiNardo of Galveston-Houston. Yet to receive accreditation to award degrees, WCC expects to graduate its first class in 2011. While Bishop-elect Etienne must be ordained and installed within the canonical time-frame of four months, smart money says the rites'll be scheduled close to the 10 December ordination of the Denver province's other freshly-named suffragan, Bishop-elect Fernando Isern of Pueblo. Its diocesan staff meeting usually held on Wednesdays, the Cheyenne curia has reportedly been summoned for an 8am MT meeting with the new boss, all the usual Appointment Day rituals to follow. With the appointment, the longest vacancy now belongs to rural Kentucky's diocese of Owensboro, which opened on the 5 January early retirement of Bishop John McRaith. Six Latin-rite dioceses on these shores now lack an ordinary, with another eight led by bishops serving past the retirement age of 75. Following last Thursday's hat-trick and the earlier naming of Bishop-elect Bernie Hebda of Gaylord, today's news sees the emergence of the US bench's fifth new member in 11 days... not a bad clip. And with that, a Happy Monday to one and all. SVILUPPO: In an early-morning note to his siblings announcing the move, Etienne said that the ordination is "planned for either December 9th or 11th... though subject to change." On the level of history, meanwhile, it's been two decades since an Indy priest was called to the high-hat: the archdiocese's vicar-general, Fr Gerald Gettelfinger, was named bishop of Evansville in 1989, where he remains today.